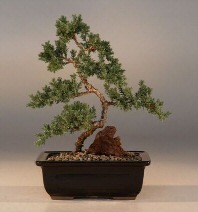 Probably the bonsai most often seen by people are the juniper procumbens nana. They are commonly sold in malls, supermarkets, and department stores as mass produced novelty items. They are commonly referred to as "mallsai". Unfortunately, these trees are usually doomed to fail because they were made to look good at the store and not for long after. However, the juniper procumbens, when prepared and taken care of properly, can make an excellent bonsai tree. In nature it grows as a low ground cover shrub so it is often trained into a cascade style. It also works as many other styles with the exception of upright forms. This article will explain how to properly take care of juniper bonsai trees and what to do if you received one as a gift. I received a juniper as a gift--now what? First, check to see if your juniper is a "mallsai". You can usually tell if you have a mallsai if there are pebbles glued to the rock surface forming a shell or if there was some sort of synthetic moss on top of the soil. If you have a mallsai you should remove this top coat of pebbles or fake moss immediately. If left on, the roots of your bonsai may suffocate or rot. Next, repot your bonsai in proper bonsai soil which, depending on your climate, should only be done at certain times of the year. Lastly, follow normal care instructions shown below now that your juniper is rooted in suitable conditions. The two most important requirements for juniper procumbens nana is getting it the light and water it needs. A juniper is not an indoor bonsai and needs to be kept outside in full sun in order to do well. Getting the watering right can be tricky, but one should find this easier if one uses a good bonsai soil. In the spring and summer mist the leaves once per day and keep the soil moist, but not soggy. One simple way to check for soil moisture content is the insert an uncoated chopstick or dowel into the soil, remove it after 15 minutes, and see if it feels damp. If so, you probably do not need to water. For more accurate measurements a moisture meter can be used instead. Fertilizing: Dilute a 20-20-20 chemical fertilizer to half strength biweekly during the spring and summer. Wait a month after root pruning or repotting before fertilizing. Temperatures: Juniper do best in USDA hardiness zones 4-8 and can survive freezing temperatures. In areas with freezing winters special overwintering procedures should be followed. Shaping: You can leaf prune in the spring and summer by pinching off needles with your fingers. Scissors are not recommended on juniper leaves since any cut needles will brown off. It is best to prune branches when you repot and wire can be applied in the winter. Pests: Junipers, especially those purchased from malls, are a favorite meal of spider mites. Usually you can spot webbing between the pine needles and yellowing of the leaves if spider mites are attacking your bonsai. Read our spider mite treatment for more information.